Iwema takes third after being passed within meters of the finish line by Zongshen's Ho Chi Fung. It was a climatic end to great racing in front of a full house. The race began with the current leader in the championship Alessandro Brannetti on pole. The former champion racer from Italy's CRP looked in great form on his eCRP1.4 bike all weekend, racing on a track that he took home the victory for CRP in 2010. He started fast from the start line and was ahead of the pack for the first two laps until the third when he was forced to retire early by pulling onto the verge at turn 16. From that point on the race was Himmelmans. His biggest threat was out of the running and Himmelman took advantage by creating an impressive lead over the wild card entry and second place competitor, Jasper Iwema, the highest profile Dutch rider of the moment and participant of the MotoGP 125cc World Championship riding a Muench motorcycle for Gamma Racing team. This was the second day Jasper has ever sat on an electric bike, and the first day on the Muench TTE machine. He put on a great show for the fans at the his hoe track stadium given he was racing on a much heavier machine than he is used to as well as with technology that is new to him. The real battle was for forth place between CRP's second racer Alex Battisini and Zongshen's Ho Chi Fung. The Italian and Chinese racers are on similar machines in terms of energy and power with both using twin Agni motors but the Italian seemed to have the edge overtaking Fung on the forth lap only to succumb to the same technical failure that had plagued Brannetti. The teams faces said it all, it was a crushing end for the well oiled team who had spent much of the night replacing brushes on their Agni motors. After the race team manager and CRP Groups director of Marketing and Sales Livia Cevolini commented "when the bike works as it should do, it is fantastic, it feels great. The bike is working well and everyone who rides it come away smiling, the only problem we have is the reliability of the motor. We will be working hard to solve the problem for the next round"
The top teams order look set until the final home straight; Himmelman took a comfortable victory to a rapturous response from the crowd; he was followed by home favourite Iwema; however, just as the finish line was in Jasper's sights, his speed begun to fade fast. With Ho Chi Fung on the Zongshen closing he gap there was little the Dutchman could do but wave past the Chinaman and concede his second place to a more consistent machine. This really was the case of the tortoise and the hare, where energy conservation played a key role in race strategies but made for a fantastic race for fans. Next stop Karlskoga, Sweden. 3rd/4th September. 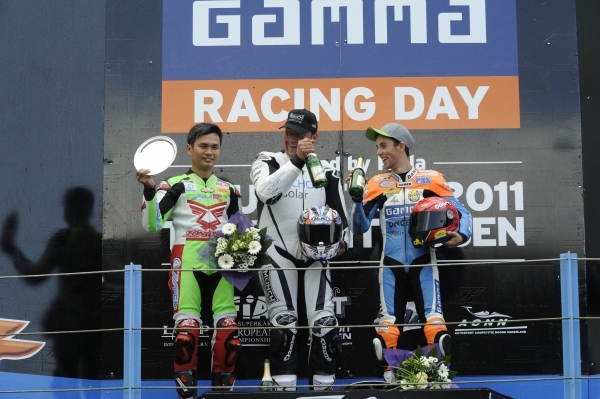 CRP Racing took the pole at the Assen TTXGP by consistantly improving its time during the race weekend. Their FP 2 time was .7s faster than the FP1 time. Their qualifying time was 3s faster than the FP2 time. Muench Racing's qualifying time was over 2 seconds slower than their FP 2 best lap. If they were able to replicate their FP2 time, they would have been on pole. Local favorite Jasper Iwema qualifyied third despite never having riden the motorcycle before this weekend. He made impressive steps, qualifying over 10s faster than his FP1 time.